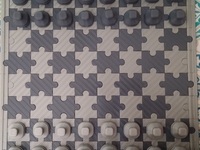 Pokemon Chess by roshandp1 is licensed under the Creative Commons - Attribution - Non-Commercial license. The entire design was done through the Tinkercad online 3D design program, and comprised of multiple files pulled off of Thingiverse. 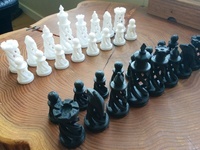 In order to create the prints, I downloaded the design for pre-made 3D chess pieces. 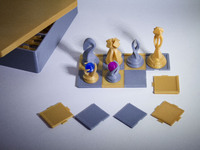 The chess pieces were then adjusted so that each piece would have a flat top to act as the base for the Pokemon. Each piece was also scaled down so that even after placing the Pokemon on top, they would still be near regulation sizes. Individual Pokemon designs were then downloaded and placed at the top of the pieces after being scaled down. Minor changes were then made, such as putting a notch in Bulbasaur's bulb, or placing a sword in Charmander's hands. Pokeball Pawns were made by simply taking a regular chess pawn and editing to sphere on top to resemble a Pokeball. Say thanks by giving roshandp1 a tip and help them continue to share amazing Things with the Thingiverse community. We're sure roshandp1 would love a Tip, but unfortunately they have not setup their accounts to receive them yet.